ABSTRACT: Airway management in complex craniomaxillofacial traumas is often difficult. The choice of intubation technique requires good assessment from a multidisciplinary team that includes maxillofacial surgeons and neurosurgeons as well as good communication between the surgeons and anesthetist. In many conditions such as craniomaxillofacial trauma, neither nasal nor orotracheal intubation is possible. In fact, nasotracheal intubation precludes the treatment of nasal fractures. It can result in meningitis or the tube can be passed intracranially in patients with fronto basilar fractures. An alternative for tracheostomy was first described by Hernandez Altemir in 1986. The submental route for endotracheal intubation consists of pulling the free end of an endotracheal tube (universal connector removed) through a submental incision, after a usual orotracheal intubation has been performed. The use of submental intubation with Altemir's technique and its modifications has been used in a large number of patients with maxillofacial injuries. KEY WORDS: submental intubation, craniomaxillofacial trauma, tracheostomy. An alternative for tracheostomy was first described by Hernandez Altemir in 1986.10 The submental route for endotracheal intubation10 consists of pulling the free end of an endotracheal tube (universal connector removed) through a submental incision, after a usual orotracheal intubation has been performed.7The use of submental intubation with Altemir's technique and its modifications has been used in a large number of patients with maxillofacial injuries.1, 11Many studies have compared the disadvantages and risks of tracheostomy and submental intubation for the treatment of facial fractures.1, 7However, the use of Altemir's technique in cranial base surgery has not been adequately assessed. This retrospective study therefore evaluated the experience of our multidisciplinary team using submental intubation not only during the treatment of craniomaxillofacial trauma. Ten patients with maxillofacial trauma were treated in our department of oral and maxillofacial surgery. All the patients were intubated via submental route of intubation .In all the patients nasal and orotracheal intubation was not possible as it would have complicated the situation so we preferred submental route of intubation. After normal oral intubation, an incision measuring approximately 2 cm. was made in the submental and paramedian region, parallel with the mandibular lower border and at about a finger's breadth from the latter (fig.1). The lower medial mandibular edge was identified using a curved haemostat. The cervical fascia and the skin of the neck were incised, passing the forceps subperiostially from distal to proximal, about 2 cm. The mylohyoid muscle was crossed in the area of its mandibular insertion, to reach the sublingual space. Where the mucosa is still tightly adherent, an incision was made, parallel with the gingival margin and which measures approximately 2 cm. in length. With the haemostat the lower edge of this last incision was detached. A passage for the tube was created from the mouth, through the mylohyoid muscle to the submental incision . The orotracheal tube was secured in the mouth to avoid accidental extubation. It was then disconnected from the breathing circuit. The end was grasped with the hemostat and withdrawn through the submental tunnel and reconnected(fig .2). When capnography and lungs auscultation confirmed the correct tracheal position of the tube, the tube was fixed at the submental level with 2–0 silk suture, in a similar fashion as a drainage tube(fig.3). Submental orotracheal intubation was completed successfully in all 10 patients. No accidental extubations or tube injuries occurred. The mean time required to place the tube was 7 minutes. No major complications (hemorrhage; injury to the sublingual glands, Wharton's duct or lingual nerve or orotracheal fistula) were observed during the mean follow–up period of 12 months. Only two minor complication occurred in two patients. There was superficial infection in two cases, which resolved in four days after washing with saline solution and drainage. The submental incisions healed in all of the patients with minimal scarring. There are certain disadvantages of this technique which can be avoided if proper precautions are taken. Infection in the floor of the mouth (careful active or passive oral hygiene is mandatory, prior to the operation), risk of submental fistulae and anomalous scars occurring, if the submental intubation is excessively prolonged, damage to important structures of the floor of the mouth. The disadvantage of having to make a submental incision has to be weighed against the trauma which accompanies a tracheostomy. Caron G, Pasquin R, Lessard M, Trepanier C, Landry PE. Submental endotracheal intubation: an alternative to tracheostomy in patients with midfacial and panfacial fractures. J Trauma. 2000;48:235–240. Hall D. Nasotracheal intubation with facial fractures. JAMA. 1989;261:1198. Schultz RC. Nasotracheal intubation in the presence of facial fractures. Plast Reconstr Surg. 1990;86:1046. Muzzi DM, Losasso TJ, Cucchiara RF. Complications from a nasopharyngeal airway in a patient with a basilar skull fractures. Anesthesiology. 1991;74:366–372. Bahr W, Stoll P. Nasal intubation in the presence of frontobasal fractures. J Oral Maxillofac Surg. 1992;50:445–451. Martinez–Lage J, Esclava JM, Cebrecos AI, Marcos O. Retromolar intubation. J Oral Maxillofac Surg. 1998;56:302–306. 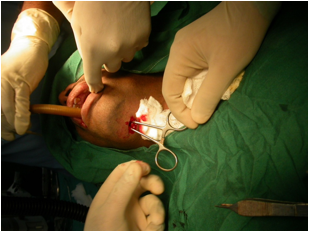 Paetkau D, Strand M, Onc B. Submental orotracheal intubation for maxillofacial surgery. Anesthesiology. 2000;92:912–914. James D, Crockord HA. 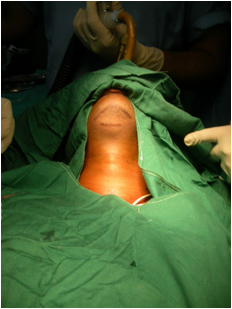 Surgical access to the base of the skull and upper cervical spine by extended maxillectomy. Neurosurgery. 1991;29:411–416. Altemir FH. The submental route for endotracheal intubation. J Maxillofac Surg. 1986;14:64–65. Biglioli F, Galioto S, Giannì AB, Autelitano L, Goisis M. Applicazione della tecnica di intubazione orotracheale con passaggio submentale nei traumi maxillo–facciali. Riv It Ch Maxillofac. 1999;10:19–21. Drolet P, Girard M, Poirier J, Grenier Y. 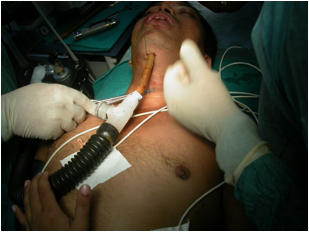 Facilitating submental endotracheal intubation with an endotracheal tube exchanger. Anesth Analg. 2000;90:222–224.